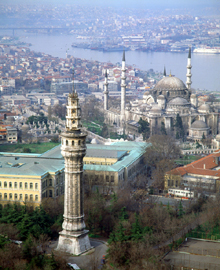 Ottoman & Byzantine relics, the palaces of Asia and Europe, Bosphorus cruise & Princes' Islands. 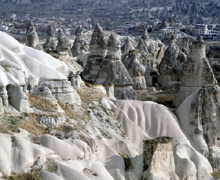 Fairy Chimneys, valleys and underground cities. Cappadocia means ''The Land of Beautiful Horses'', an area possessing supernatural beauties and rich in cultural values, that have always been charged with deeper senses by the inhabitants of the region. 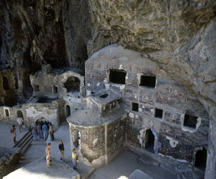 Cappodocia is waiting for you to listen to the silence which reigns in the valley day and night, during all the seasons. You can listen to the breeze playing Pan's flute while dozing in a pine-shaded cove. 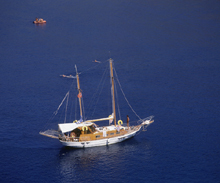 The Blue Voyage is an adventure and in this mystical aspect, the Blue Voyage in Turkey is different from any other yachting holiday anywhere else in the world. The Black Sea is waiting for all of you with its turquoise colour sea, all green forests, highlands, piercing mountains, centre of various empires and kingdoms, gardens of hazelnut and tea, seemingly endless stretches of beaches, famous local cuisine, friendly people and hospitality. The South-eastern Anatolia region has a very rich history and cultural heritage, as can be seen in its magnificent historical sites. Its history begins around 7,000 BC in the Neolithic period. Between 2,000 BC and 1,500 BC came the Hurris who were followed by the Hittites around 1,200 BC. Abraham, the patriarch claimed by three world religions, lived in the region which encircles the Euphrates and the Tigris Rivers. In Harran, the most important Mesopotamian historic and cultural centre can be found. Other important areas of the region are Diyarbakir, whose city walls are a superb example of medieval military architecture; Mardin, with its regional architecture, and Antep, a large trade and industrial centre which contains the remains of late Hittite cities. Antioch is an inexhaustible treasure-house of history and a centre of civilization. 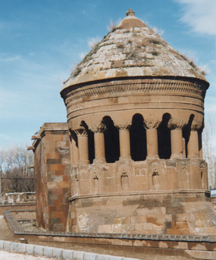 The region's long and turbulent history has left monuments to its various civilisations: Byzantine monasteries and churches, Seljuk mausoleums and caravanserais and elegant Ottoman mosques and hilltop citadels. To all travellers and lovers of adventure, this tour-region fascinates, astonishes and informs. A mysterious land which may share an intimate secret with you when you wander on each piece of soil. Van is the city famous for becoming the capital city of ancient Urarthu civilisation, for its lake, the famous Cats of Van, its very special cuisine and the utmost hospitality of its people. Magnificent Mount Ararat stands as a statue wherever you go. Konya, the ancient Iconium, one of the oldest cities in Anatolia and Çatalhöyük is one of important excavation sites of the Neolithic period. Pamukkale; a living paradise. Hierapolis and Aphrodisias, the ancient cities full of thermal beauty-sources to compete your vacation. 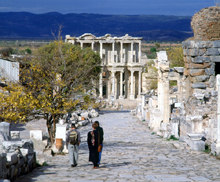 Ephesus and Pergamum are in the area of the wealthiest district of Turkey. They were created with human efforts during ages and more effort still went to bringing them up to daylight.